In one fundamental sense, Trump’s spiky language resembled that of a previous US president, one whose simplicity remained innocent to the deep greyness of international politics. George W. Bush, whose childish rendering of the world into friends and those of the “axis of evil”, would have found little to disagree with. The next stage of the Korean gamble shows the public front of delusion and self-denial. Trump retains the cobwebbed view a growing number of US strategists disagree with: that denuclearisation at the moment is pure fantasy. Take it off the table, as the Kim Jong-un regime will never have a bar of it. Indeed, Trump felt that “Rocket Man is on a suicide mission for himself and his regime.” The noble, restrained United States, with its “great strength and patience” would, if forced to defend itself or its allies, “totally destroy North Korea.” Such suitable restraint. Iran also reserved a special spot in the Trump show of rancour. Without any glimmer of contradiction, Trump noted a visit to that great standard bearer of peace and moderation, Saudi Arabia, where he was “honoured to address the leaders of more than 50 Arab and Muslim nations.” The theme? Combating terrorism and Islamist extremism. No better place, perhaps, than Riyadh to address these niggling points. Across the country were instances of starvation, democratic corrosion, an “unacceptable” situation that demanded intervention, military, if necessary. Trump’s address ticked the boxes of a very distinct nomenclature, the sort alien to the diplomatic corps and dogmatists of the liberal market credo. Swedish foreign minister Margo Wallström found his performance barely believable. 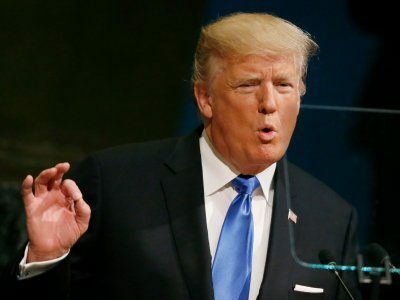 In other respects, Trump foisted upon his UN audience a brand thinning with each speech and press release: the America First label, the art of the necessary deal centred on a responsibility for citizens. Trump preferred the necessary deal, America First as a warming vision of cosy affluence, a form of nostalgia in action, an effort to restore those vanished jobs running into the millions and confront those who “gamed the system and broke the rules.” In so doing, the middle class received a historical caning, forgotten in a bout of mass amnesia. Never again, he intoned, would they be forgotten. It was a speech insistent on the supremacy of sovereignty while also praising the UN as a forum where disputes and challenges could be resolved. “If we are to embrace the opportunities of the future and overcome the present dangers together, there can be no substitute for strong, sovereign, and independent nations”. This is Trump pure and simple, unable to reconcile the dictates of stomping sovereign will with the notion of calm collective action, thereby undermining both.